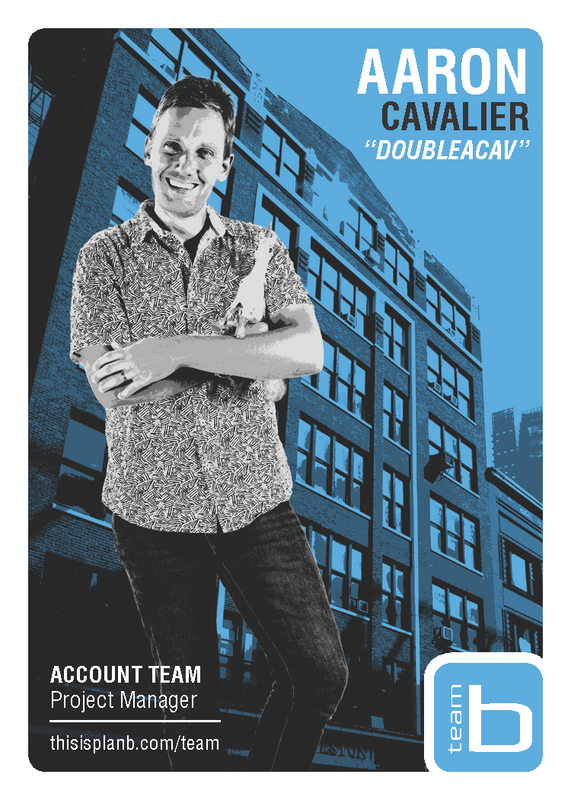 Aaron joins Plan B after spending a few years perfecting his Project Manager skills at various agencies around Chicago. His expertise in B2B agency work includes management of strategic direction, campaign concepting and creative development, logo work, print collateral, full websites and his personal favorite –– the radio jingle. Involved in every aspect of his client’s engagements, Aaron is eager to bring his skillset to the Plan B table, beginning with strategic research all the way through the final creative execution. He prides himself on using his engaging and energetic attitude to build good client relationships as well as build stronger brands, while also being open to learning and embracing new challenges. Outside of the office, Aaron enjoys running by the lake, playing basketball with his friends, improving his mediocre golf game, and spending time with his family –– his wife and two cats. Aaron graduated from Dominican University in River Forest, Illinois with a degree in English.